Are you looking for a way to make a difference in the world? Would you like to be able to teach meditation to children? 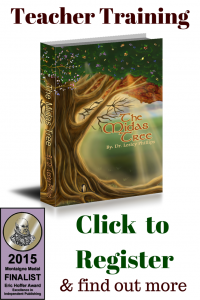 Since writing The Midas Tree I have been approached by people who tell me it made a difference for them and their children. Some of them believe their purpose is guiding young people. They say The Midas Tree gave them a way to teach their children, grandchildren and students about spirituality in a simple and neutral way. This gave me an idea. What if I created a course to teach the marvelous techniques presented in The Midas Tree?Then anyone could help children reduce stress, increase focus and connect with their inner wisdom. If you have read the book you will know how these simple tools are life-changing. So I developed a course with a training manual, videos, audio meditations and color posters. Topics covered are grounding, centering, earth energy, cosmic energy, creating and destroying and manifestation. The meditations in this course present the techniques in more depth than in the book. The audio book is included, so you can follow the story and learn in the same sequence. Book a review session with Lesley. To remain listed as a certified teacher on The Midas Tree website, you must demonstrate you are regularly teaching the course by registering your classes. This course is great for parents and children to do together. You can take the course and not teach it. But if you do register as a certified teacher, you can also use it to teach adults. Find out about your rights as a teacher or non-teacher.